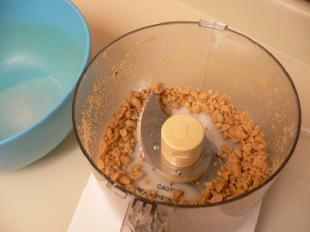 Place Peanuts into food processor. Pulse machine on and off a number of times to chop the nuts into small pieces. Try not to make peanut butter. 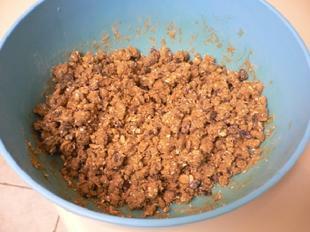 Empty nuts into a large mixing bowl. 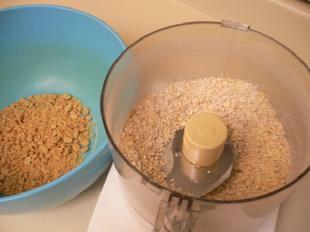 Place oats into the food processor. Run machine long enough to turn the oats into a coarse meal, leaving some larger pieces for texture. Empty oats into the bowl with the peanuts. 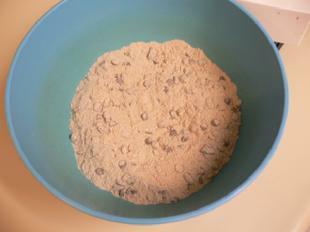 Place whole wheat flour, buckwheat flour, baking soda, baking powder and cinnamon into the food processor. Pulse machine on and off a few times to mix the ingredients together. Empty ingredients into the bowl with peanuts and oats. Add the raisins and chips to the bowl. Using your fingers. mix and toss everything together. Pay special attention to breaking up any raisins that may be stuck together. 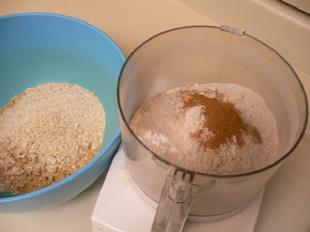 Measure and place all wet ingredients into the food processor. Run machine for about half a minute to puree everything together. Pour wet ingredients over the dry ingredients. Be sure to use a spatula to get all of the wet puree out of the bowl. 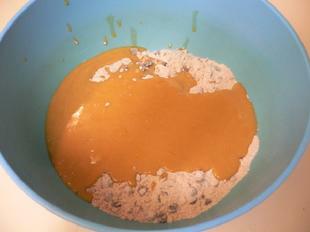 Using your fingers again, mix and gently toss the wet and dry ingredients together. Be sure to mix in all of the dry ingredients that are on the bottom and sides. You should end up with a chunky mixture that resembles large pebbles. Try not to over work the cookie dough, it should not be smooth. 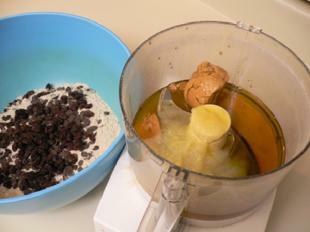 Using both hands, scoop and pack 2 ounces of dough into an ice cream scooper. This recipe will yield 15 cookies. Place the cookies onto a sheet pan. 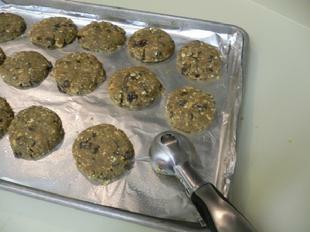 Gently press the dough to make the cookies flat. They will not flatten as they cook, like other cookies. Bake on the middle shelf for 22 minutes. The cookies freeze very well. I have recently read an article that makes a case for the idea food manufacturers engineer products that are addicting by design. I am not sure which came first, the recipe that just happens to be addicting or the product built to be addicting. I do know that when I used to eat regular cookies I could eat and eat them and never feel satisfied. The more I ate the more I craved. The more I ate the sicker I felt. This is the result of white flour and white sugar blowing through your body in an endless vicious cycle that we have all experienced. 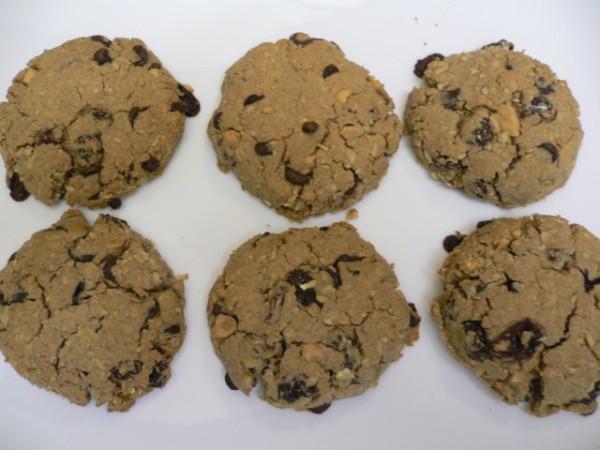 I can tell you that these vegan peanut butter-chocolate chip cookies have been designed to be delicious, filling and satisfying. If you make a batch you will not believe how long they will last in the freezer. It is remarkable that after eating one cookie you are completely satisfied and will not want another one until the next day. One last thing, I must bring up the word vegan as I am constantly reminded how some people are absolutely afraid of the word.